REAL Cooperative | Regenerative Education, Action and Leadership. Get REAL! In mock “celebration” of the 129th anniversary of Santa Clara County vs The Southern Pacific Railroad where the Supreme court made the notion that corporations are people and should share the same constitutional rights as humans. In celebration of this corporate birthday we will invite speakers, musicians and actors to educate and entertain spectators while encouraging them to support the “We The People” constitutional amendment which would strip corporations of their constitutional rights and assert that money is not free speech. To get involved contact Ben@realcooperative.org. Asheville Tool Library Spring Updates! 1st, Project Update: We found a location! We officially launched this project about 2 years ago in the Spring of 2013. Since that time we have been hard at work: fundraising, finding a fiscal sponsor, collecting tools, doing community outreach and trying to find an initial location for the Asheville Tool Library. After thinking we had figured out a space more times than I can count on one hand we have finally found a winner! We are partnering with an exciting group of organizations to share space in (East) West Asheville on ‘the corner’ of Haywood Rd. This project has been a volunteer driven labor of love since its inception and we need your support now as much as ever if this is to be successful. The community is asking for this to happen, we have reached over 1,000 likes on Facebook and get requests for tools almost every week. While financial contributions are necessary and much appreciated we also need more volunteers with al sorts of skills to plug in and join our team. 2nd, Volunteer Meetings: Lets open this thing already! After a long year of potential locations, false starts and general project atrophy we have finally found a space and are working through the final details. In the coming months we’ll be launching our initial tool and membership drives, creating the front end of our website, building out our space and making the final preparations to open this Summer (or maybe even late Spring)! At these meetings we will break in our location and discuss the next steps we can take as a group to ‘Build it Together’. Feel free to bring food or drinks to share. Light snacks will be provided. Were accepting (Tax Deductible) Tool Donations! We have been slowly stockpiling tools for the last year to prepare for our eventual opening and could use a lot more before we’re fully stocked and ready to go. We’ll be launching a ‘Tool Drive’ soon and if your interested in making a donation now please contact Nick Letts: Donations@ashevilletoollibrary.org to schedule a drop off/pick-up. 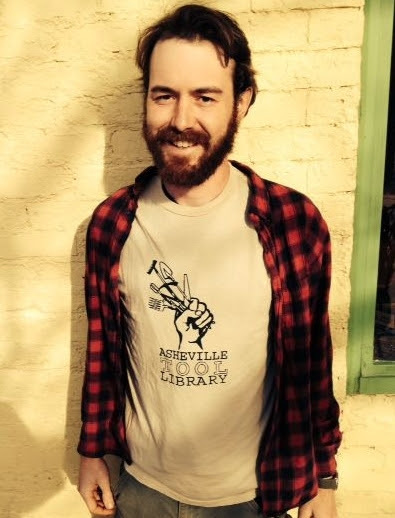 We have Asheville Tool Library Shirts! Want one for your self? How about a friend or relative? Come to our meeting and pick up one of these high quality Hemp/Organic Cotton T-Shirts or Hoodies for a $20/$30 donation. 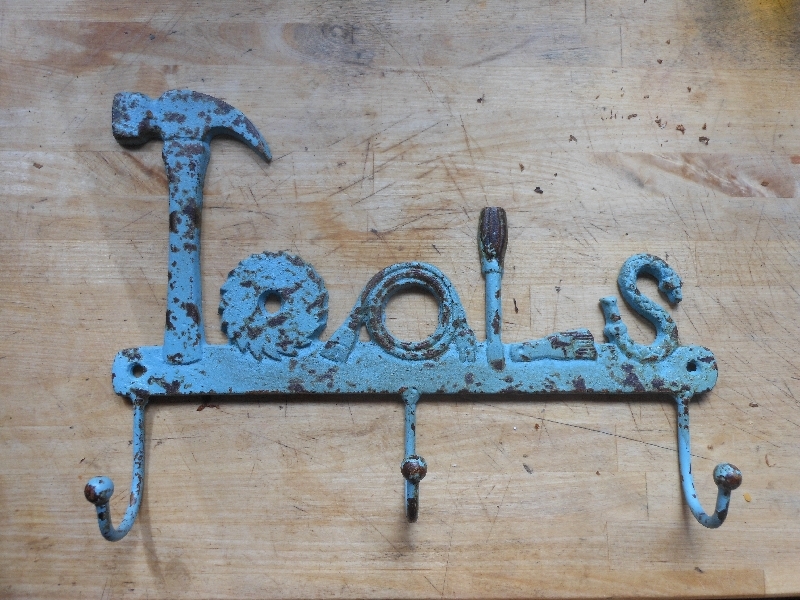 Asheville Tool Library is a Fiscally Sponsored Project of Empowerment Works. Asheville and Buncombe County have a lot to offer its citizenry. On the surface it is easy to see the countless restaurants, boutiques, bike shops and breweries, but much like in most cities there is more to this mountain town of ours. Many of these surface offerings aren’t designed to serve those who actually live here and large portion of our community can’t afford or lacks access to participate. At the same time there is an often invisible and unconnected network of initiatives, resources and services supporting our citizens and building community. After 4 months of accepting community feedback and expanding the scope of the project we would like to welcome you to the SHARE Asheville Community Directory and MAP. This list has been and will continue to be “crowd sourced” from the community and we welcome your feedback and suggestions. The directory (and Map) aims to showcase the Sharing Projects, Collaborative Consumption and Common Resources which Asheville has to offer. Scroll through the over 150 offerings in 7 sections: Food, Services, Reuse, Community Health, Community Wealth, Commons and Public Libraries. We will soon be developing a list of “Off the Map” resources serving the community without a physical location. Have a suggestion for something we should add? Or maybe you think there is something which should be removed?? We rely on feedback from the community to make this a useful resource! Please submit all suggestions through this FORM. This Map is only a launching point for a larger initiative were calling SHARE Asheville to foster the further development of community serving policy and infrastructure to support the, for lack of a better word, sharing economy. SHARE Asheville will be hosting our first large event later this Spring. Asheville ShareFest will take place on May 31st at the French Broad Food Co-op and will be a series of interactive co-created events which will take place on Friday, Saturday and Sunday May 30th-June 1st showcasing local organizations, projects, resources and skills while highlighting examples of the sharing economy which nationally has become a (new) social safety net and multi billion dollar industry in the new economic framework. The event will be one of over 25 ShareFests taking place in cities around the world in the months of April, May and June as part of the international campaign coordinated by Shareable, Center for a New American Dream, OuiShare and other organizations. Please let us know if you would like to co-create this event with us by filling out this FORM. Represent RAN at a Beats Antique Show Near You! 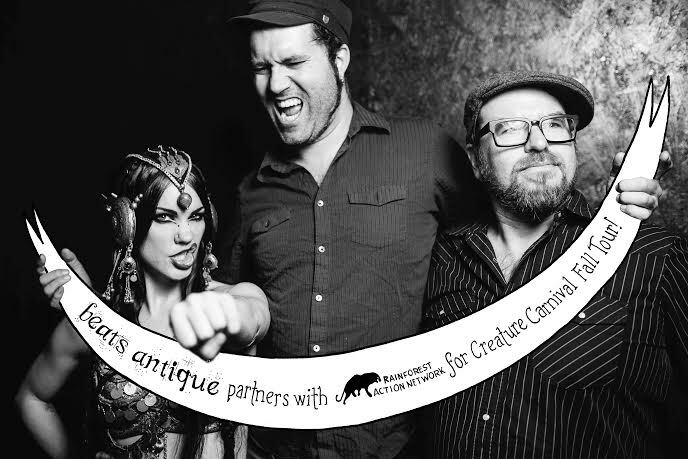 Rainforest Action Network is partnering with Beats Antique on their Fall Tour, “Creature Carnival,” to raise awareness about the importance of protecting tropical rainforests and its many inhabitants. If you aren’t familiar with the music of Beats Antique and/or haven’t seen one of their spectacular live performances then you are in for a treat! The band mixes world fusion and electronic music; beyond the incredible music their live shows feature performance art and heavy percussives with Tribal Fusion dance. Given the theme “Creature Carnival,” the band sought out an organization doing effective work on behalf of wildlife to feature in all the shows. This tour includes 21 live performances from Los Angeles, CA to St. Paul, MN to Washington, DC between October 15-November 8. 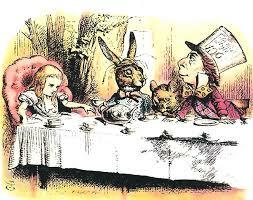 We are looking for passionate volunteers to work our RAN table at Beats Antique shows in cities across the country. You will get into the show for free as long as you represent RAN throughout the evening at our table, passing out Forest Program brochures, Last Stand of the Orangutan stickers, RAN bumper stickers, and signing people up to join the Palm Oil Action Team. 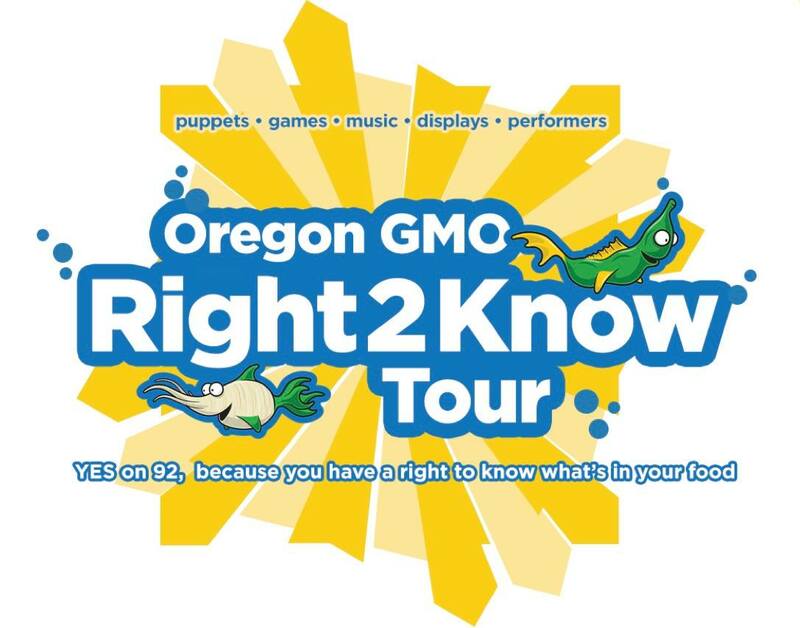 Please check out the tour dates and locations, and if there’s a good match with your location and availability please kindly email Emma at emma@realcooperative.org. We hope you take advantage of this unique opportunity! REAL Cooperative and SHARE Asheville present the first Annual Asheville ShareFest on May 31st in the parking lot of the French Broad Food Co-op and inside Co-Luminate downtown on Biltmore Ave. Asheville will join cities all over the world to host a ShareFest on Saturday May 31st as part of #SharingSpring and Global Sharing Day to celebrate local Sharing Initiatives, Collaborative Consumption Resources, and the Preservation of the Commons. Share a Skill, Get Up and Perform, Swap some of your unused Stuff, Exchange some Seeds or Speak your Peace. This is a participant driven event and won’t be the same if you don’t show up and participate. Really Really Free Market (Stuff Swap), Skill Share, Bike Repair (At Recyclery), Seed Exchange, Entertainment (Open Mic, ‘Show and Tell No Talent Show’), Soap Box (Speak your Peace), Booths, Collaborative Art Projects, Kids Activities… What will you Share? This co-created event will showcase local organizations, projects and knowledge. 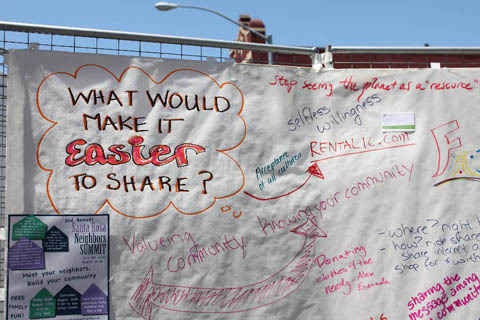 Asheville ShareFest will highlight examples of the sharing economy which has become a (new) social safety net and multi billion dollar industry in the new economic framework. The event will be one of over 40 ShareFests taking place in cities around the world in the months of April, May and June as part of the international campaign coordinated by Shareable, Center for a New American Dream, OuiShare and The People Who Share. Please let us know if you would like to co-create this event with us and offer a Skill, Performance, Activity by filling out this FORM. SHARE Asheville will be hosting coordination meetings (link to FB Event and details) on Wednesday evening’s from 7-9pm 5/14, 5/21 and 5/28 if you would like to help make this event happen (nudge, nudge).